Location: Razgrad is situated right in the Ludogorie Plateau, on the two banks of the Beli Lom River 375 km southeast of Sofia. 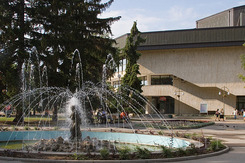 It is a regional centre and a centre of the pharmaceutics in Bulgaria. History: Thracian tribes inhabited the region and found a town with unknown name. Later the roman town Abritus was established in the site. During the Medieval period the Bulgarian settlement Hrisgard emerges in the region. In 1388 the town falls under Ottoman rule and during the national revival period the town becomes a craftsmen centre. Sightseeing: The monuments of culture from the Medieval and Revival period are countless: “St. Nikolai Chudotvorets” temple, the first domed basilica, built in this part of the town, the clock tower (1864). A complex of restored houses in a traditional style in the architectural neighbourhood “Varosha”, reminding for the authentic atmosphere of the town from the XIXth century. Many museum houses of important persons from the town that contributed for the Bulgarian national culture, ethnographic museum, clubs of culture figures and etc can be found in the neighbourhood. The High School of Razgrad occupies an Austrian Hungarian baroque building. The archeological complex Abritus nearby Razgrad is one of the best explored, well laid out antique towns in Bulgaria. Lesopark “Pchelina” with great opportunities with wonderful opportunities for relax and tourism, natural reserve “Voden” with a goal farm for deer and moose. The Thracian tomb in Sveshtari village is just 40 km away from Razgrad is listed in UNESCO heritage list. 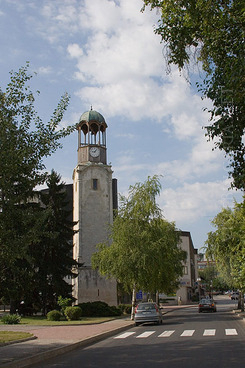 Please check out our list of accommodations and information, if you want to visit Razgrad.